Imagin ing details in a past that never was, great airships travel the skies, seeking adventure and fortune. But what do they leave in their wake? As the moon will attest, explorers may leave a few items behind, the flotsam and jetsam, the tossed cargo, the unnecessary items shed in the rush to embark. 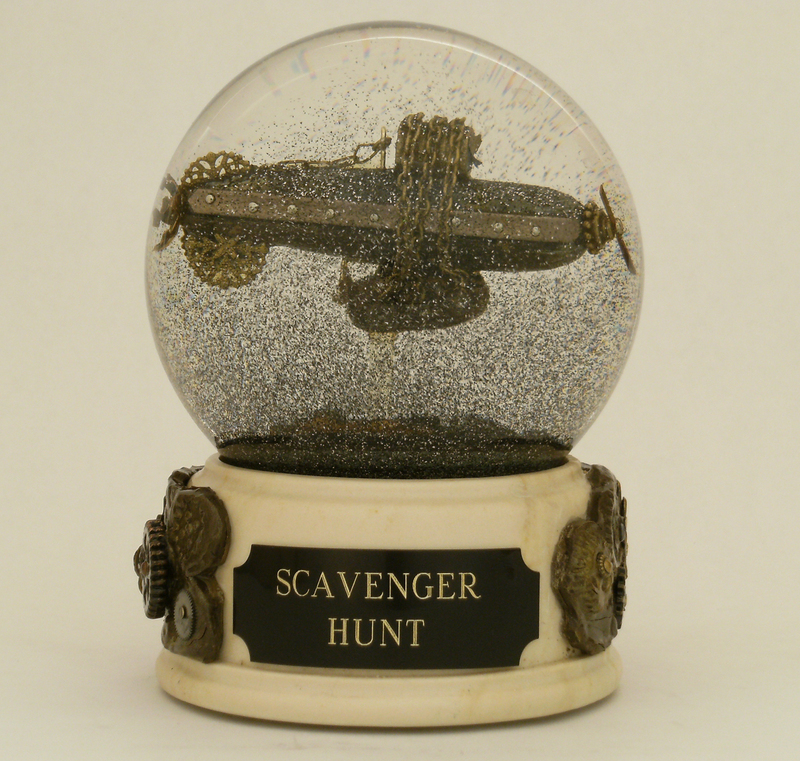 This waterball (snow globe) is a snapshot of a mysterious scavenger airship carrying cargo wrapped tightly with chains. Recycle, re-purpose, re-use the refuse. The patched and battered zeppelin floats slowly, thoughtfully, perhaps hovering while deciding whether to scavenge lost parts and useable items from the surface below. When the glass globe is shaken, the liquid is filled with a cloud of dark, smoky gray metallic powder, reminiscent of the heavy air in an industrial city. It’s hardly fair to call it a snow globe, when the world is full of sparkling mystery and dark opportunity.